In order to keep track of typing lesson results, users are required to sign in. User can either register new account with AlfaTyping.com (email is required) or sign in using Facebook account. 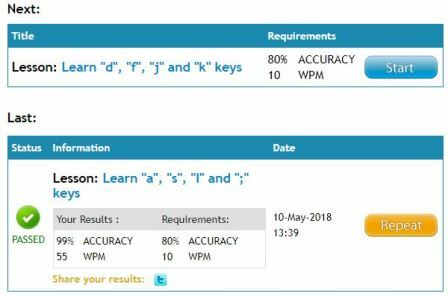 In typing tutorial page user sees which lesson is the next lesson to learn, what was last lesson and its results and user can either start the next lesson or repeat last lesson. Although, it is highly recommended to follow lesson order, user at any time can take any lesson within the scope of current tutorial by selecting lesson from special drop-down list of lessons. Using right fingers to press right keys is a key to learn touch-typing. This is why at the beginning of each lesson user sees a hint – which finger to use to press certain key on the keyboard. User has 10 seconds to place right fingers over the right keys. After countdown ends lesson starts automatically. If user does not want to wait, he/she can click start button to start lesson immediately. In addition, user can pause, restart or exit the lesson. If user makes typing error it is visible immediately and user can use Backspace key to fix the error. As soon as last symbol typed on lesson window, user redirected to Typing Tutor page where he/she can see lesson result in last lesson section. 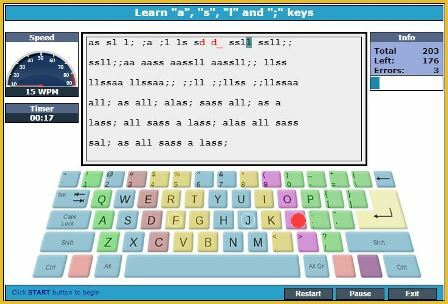 Please, try our demo typing lesson without registration and see in action how actual typing lesson works. The final exam of selected tutorial will not be accessible until user achieves recommended results of all typing lessons in this tutorial. As soon as all requirements met, Final Examination page will allow user to take the exam, upon completion of which user receives corresponding typing certificate.